Two Virgin Gorda youths have profited from their experiences in the Gazprom Football For Friendship camp in Moscow, Russia, that ended just as the FIFA World Cup got underway. The camp attracted participants from 211 countries around the world and coincided with the start of the FIFA World Cup and ended on June 16. 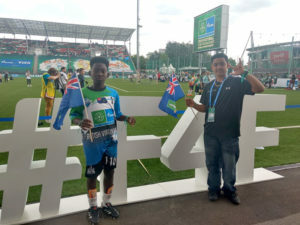 Young journalist Ryan Ramlall and footballer Deshawn Richardson, all said they enjoyed the once in a lifetime experience that was capped off by seeing the Russia vs Saudi Aribia match. It was the first time they had been in an arena with so many people. They were all part of the 32 teams named after animals from all the continents. Rodgers, who played in three games as goal keeper, said his game has improved from the camp. For Richardson, 12, a Robinson O’Neal Sixth Grader playing on the Humpback Whales, his highlight came when he scored the second goal off a pass during a 3-1 victory over the Cheetahs. Richardson said it was a challenge on his team since many players didn’t speak English, but, from the drills, he picked up skills that can improve his game. Ramlall, 13, a Bregado Flax Educational Center Eight Grader, said it was a ‘life changing experience’ and he learned new aspects about the world and its people and how the event could bring so many people from around the world together. He said after each game, the six young journalists in his group got together and wrote a story that was published daily. Along with Ramlall’s father, they attended the World Cup opener with hosts Russia in attendance and were among the 78,000 fans. Ramlall said the opportunity was a rare and exciting one.